The College will ceremonially begin the Christmas season on campus with an Advent Vespers service followed by a festive tree lighting, beginning at 4:30 p.m. Tuesday, Dec. 4. The Advent Vespers service will be in Our Lady Queen of Peace Chapel between St. Scholastica Monastery and Tower Hall. This contemplative service is conducted partially in candlelight and features performances from the St. Scholastica choirs. The service will be immediately followed by the Christmas tree lighting event at about 5:15 p.m. in front of Tower Hall's main entrance. In a time-honored tradition, participants will proceed from the chapel to Tower Hall carrying lit candles. 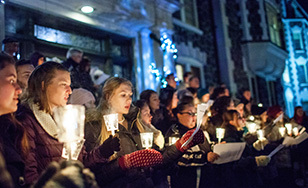 St. Scholastica President Colette Geary will lead a countdown to the tree lighting, followed by everyone singing Christmas carols led by the choirs. Guests will have a chance to enjoy cookies and hot chocolate in the Tower Hall foyer. The event is sponsored by the Student Alumni Association. Both the Advent service and the tree lighting are free and open to the public.